Good Morning everyone!! I hope you all had an AMAZING time with your loved ones yesterday!! Each year we’re all able to spend together is a special one because it’s not always guaranteed with D’s career. And it’s not always guaranteed in general either! So I hope you were able to eat lots of mashed potatoes, rolls, ham and pie (my favorites obviously 😉 ) LOL! and that you enjoyed the presence of those you are thankful for! But let’s get to why we’re really here! I’ve listed all the best Black Friday sales going on right now and the codes you might need to use during checkout, to make your 2017 Black Friday a little LESS hectic!! (If that’s even possible right? 😉 ) And you can shop directly from the links below! *More sales will be going up over the weekend, so I’ll continue to add them here! So don’t forget to check back! And I’ll also be posting a Cyber Monday blog post with all the sales going on that day too! Happy Shopping! And if you haven’t already, don’t forget to check out my last blog post!.. It’s all about my exciting, scary, life-changing news! You won’t want to miss it!! ** This belted satin jacket is 52% off right now!!! Click the image above to shop! Previous Post I Have Some Exciting, Scary, Life-Changing News.. Thank you so much! Heading out now and taking your list and I definitely need that clutch! Happy Shopping! OMG thanks for this roundup! I’ve been looking for a place where all the sales are listed! That’s actually such a good idea to just list the places with discounts! FAB and love your outfit! This is such a great source of discounts! I’m also happy that brands are actually extending the sales all weekend and I am shopping from home. I LOVE your outfit and the color of the jacket !! *-* I love the deals of this year. I got the feeling that a lot of brands have stepped out with better deals this year. Thanks Marcella! My jacket is on super sale too!! haha right!?! i spent wayyy too much! Wow these are some great Black Friday deals you found! Thanks for sharing, xo. Right?! Such a good Black Friday this year! Your jacket in these photos is gorgeous by the way!! Thank you so much Lauren!! Online shopping is the way to go!! We do not celebrate Black Friday in our country but I am in love with your outfit. 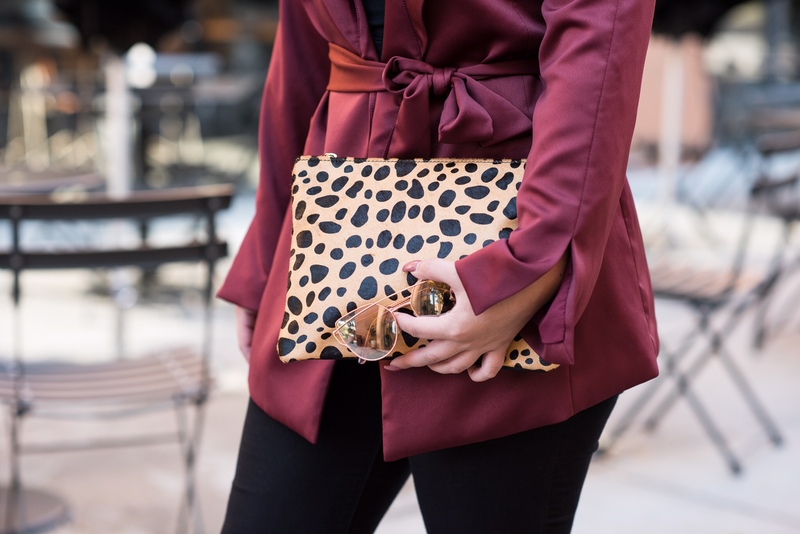 The maroon jacket and leopard clutch looks so pretty! Thanks for sharing. So many great codes and deals! Thanks for sharing these. Heading to Saks now hehe. So awesome that there is a lot of sales going on but I missed it. Love your outfit. OMG THANK YOU! These are so helpful and I am so glad you shared all of them for us. It’s so hard to figure out what sales are where!